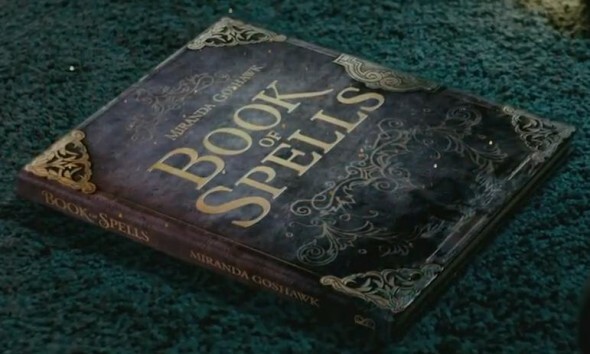 Sony bring us Wonderbook: Book of Spells. In this exclusive game for PS3 you are a wizard apprentice in the Harry Potter universe and have to learn your spells with the help of a magical book. What to expect from a game like this? Let’s find out below. You are a wizard student at Hogwartz who finds a magical book in the library and gets permission to study the book. In the book you’ll find 5 chapters which you’ll have to complete. Each chapter contains 4 spells to master and at the end of the chapter there’s a chapter test which puts your magical abilities on the line. Some spells will have a page with extra information, more precisely their history, which you can see in a funny interactive animated clip. When completed a chapter test you’ll get a conundrum (for our not native English readers, this means a word riddle) and if you finish all chapters you’ll get the answer to them all. As this was the first augmented reality game I played so far, I was quite impressed with the graphics. First I was not sure how it was going to work, but as I started the game and the book in front of me was magically transformed in a nice looking book on my screen I was very impressed what Sony managed to do with the Playstation Eye camera. When opening the book, the world around you transformed in another reality and you really felt if you were in the Harry Potter universe. I wish I could have stayed there as I really liked having magical powers. The music from the game is very well done. It’s the same style as the Harry Potter movies. Heck, they are so well done they could have been in the movie soundtrack. Also the voice of the male narrator was very well chosen, he has a warm likable voice which is nice to listen to. Ditto for the female voice who narrated the animated movies and conundrums. When opening the book you have to pull the letters out of the book into the air with your wand to start the lesson of the first spell. 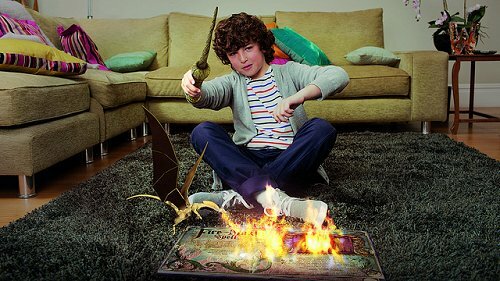 While learning the spells, you’ll learn the incantation (which is the same as in the Harry Potter books and movies) and the movement you have to make with your magic wand in order to be able to execute the spell. After each spell learning you have a little practice game to fully master the spell. Sometimes there’s also a scribble on the page of a spell made by a former student of the book. But beware sometimes it’s a useful tip, but other times it’s a silly prank. Then at the end of the chapter is a chapter test, where you’ll have to use your 4 newly learned spells by quickly thinking which is the right spell to use to solve the problem. The only annoying part of the game was that in these tests you had to be quick at times, but when you had to flick your wand it did not always work from the first time. You had to flick two or three times to get it right but often you were already it by your opponent and it was too late. Upon completing these test you’ll get rewarded house points based on your performance. There were however some bugs in the game. I encountered the first one when I had to wipe some dirt of my book. Whatever I did, my hand was always under the book so I was unable to wipe of the dirt. I had to restart the game to get it right again and then I was able to continue. This happened a few times to me. The second one only happened once, while I was turning my page the game froze and I was unable to do anything, even pressing the PS button did not work. So again I had to restart my Playstation to continue. But beyond that, the game ran really smooth.